The Buffalo Dominator is a stylish American style pool table with drop pockets, available in two different sizes and two high quality finishes. This sleek, modern table perfect for games rooms and communal areas. The Buffalo Dominator is stylish yet robust, ensuring quality gameplay at a highly affordable price. Featuring a new sporty design that will appeal to all players and a fantastic build quality that makes it suitable for your home, a leisure facility, school or club. The table is supplied with a genuine three-piece 1" thick slate, laminated cabinet, rounded top rails with sight spots, metal pocket plates, leg levellers and tournament standard cushions. Supplied with optional stickers for the side of the table - it is totally your choice as to whether they are affixed or not! The Buffalo Dominator can be fitted with an American Atlas speed cloth available in: Green, Black, Blue, Purple, Burgundy and Red. Atlas cloth is an American speed cloth, designed to increase ball speed and accuracy during game play. When choosing your table it is important to consider the size of the site or room you wish to put it in. It is recommended that there is enough room to fully extend your cue from the edge of the table to the wall. 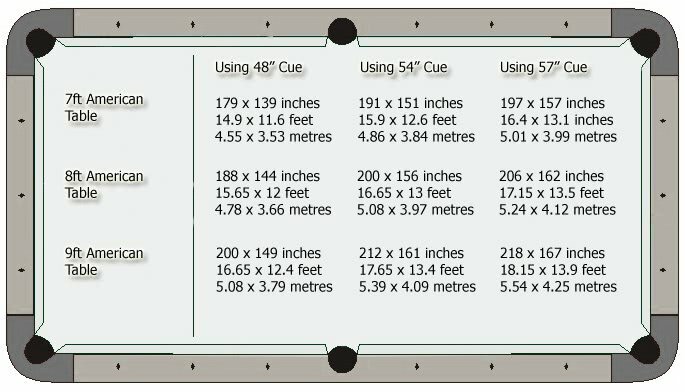 The dimensions below are ideal sizes, however if space is tight why not purchase a smaller cue for those tricky shots.